During the spring and summer of 2018, Umpqua Valley Audubon Society partnered with Umpqua Wildlife Rescue to rescue, rehab and release urban nesting Green Herons. First heron came in on 28 May 2018 and the last one on September 3 2018. 17 young green herons came into UWR this season, all through the hotline. 12/17, 71%, were released. Roseburg: total of 14. Six came from downtown Roseburg; three from Stewart Park; two from the YMCA; one from Hucrest; and two from Green. The remaining three came in from Canyonville, Sutherlin and Winston, one from each location. Total 206 days of care; average of 12 days per bird. Two were injured while in our care: one broke a wing while in a flight cage; another broke a leg while in a different flight cage. The one with the broken wing had to be euthanized; the second with a broken leg was treated, recovered and was released. Four came in injured. One of those was euthanized due to a severely broken wing (from YMCA). One came in severely injured, unable to sit up (Canyonville) and died 4 days later; two died within the first 24 hours of coming in (both from Roseburg). The fifth was euthanized after breaking a wing in a flight cage. We need safer flight cages for the green herons. We need a more reliable system to have live fish available as needed. Keep spreading the word and distributing posters on how to contact UWR for young herons found out of nests. UWR members involved: Diana Wales, President of Umpqua Valley Audubon Society, worked with UWR to develop a program to establish UWR’s response to caring for young green herons. 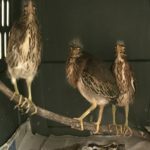 The program provided training and care specifically for young green herons. She and Ann Sedlacek completed UWR’s Wildlife Rehabilitation training and were the sub-permittees caring for the herons this year. They worked under the supervision and mentorship of Brenda Weber, licensed rehabber.